App Stop is an interesting and a very useful application. It works with any Symbian^3 phone like Nokia N8 and lets you kill any running application. You can kill one or more running processes instantly. It also displays the processes that are sometimes not visible through the normal view. I have found my self struggling with a number of applications that end up not responding and I need to restart my phone. In times like these, App Stop is the right utility that you need. It has a very simple user interface. At bottom of the screen, you have three buttons - Select None, Kill and Select All. Now, you can either select all the running applications using these buttons and kill them or tap/select the desired process visible in the application's list to kill. Further, this application is very small in size (16 KB) and available free of cost. 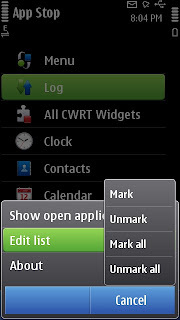 I would strongly recommend App Stop for your Nokia N8. I have found this very useful in terminating J2ME applications which the inbuilt task manager is unable to.